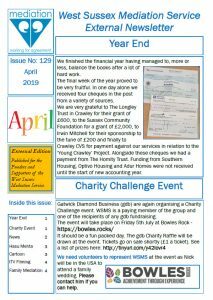 Time for our April Newsletter. In this four page edition we cover a range of subjects, some good and one quite sad. Due to some embargoing, we are having to withhold greater detail, on two of our news items, until a later date when ‘all will be revealed’. Please note the request to keep your evening diaries clear for early June, as we hope to invite may of you to an event during Volunteers’ Week. Click here or on the image below to view the newsletter. Remember that you can sign up for regular updates at the bottom of our News page.